Today's Image of Mars shows lava flowing into a crater from two distinct flows. The 3km wide crater is located in Southwestern Daedalia Planum, which is south of Arsia Mons. On the south (bottom) side of the crater a lava flow made contact with the raised rim of the crater, but because the lava flow was not as thick as the height of the crater rim it was not able to break through. We can tell the crater is older than the southern lava flow because the lava flow has blanketed the ejecta that normally surrounds an impact crater and it has pushed up against the rim of the crater, much like water does when it encounters a barrier. Later, a thicker lava flow came from the north and was able to break through the rim and start filling the crater. If the rim had been a little smaller, or the lava flow thicker then the crater would have been filled. The HiRISE team studies lava flows like the two here to determine their thickness, viscosity, and rate of movement. These measurements help scientists to determine the composition and temperature of the lava flows. 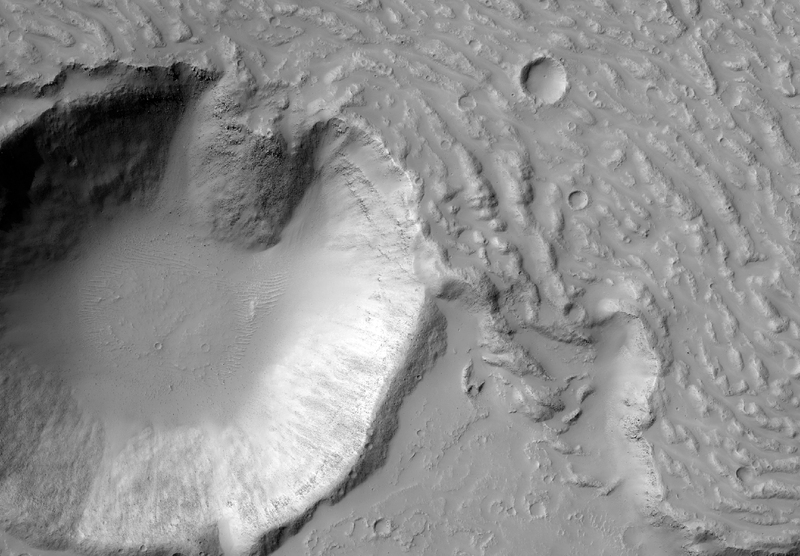 Clicking on this image will take you to a captioned variation of this one from HiRISE.